Professor Ho conducted a survey and phone interviews with city officials responsible for Big Data initiatives. Based on his research, the report presents a framework for Big Data initiatives which consists of two major cycles: the data cycle and the decision-making cycle. Each cycle is described in the report. The trend toward Big Data initiatives is likely to accelerate in future years. In anticipation of the increased use of Big Data, Professor Ho identified factors that are likely to influence its adoption by local governments. He identified three organizational factors that influence adoption: leadership attention, adequate staff capacity, and pursuit of partners. In addition, he identified four organizational strategies that influence adoption: governance structures, team approach, incremental initiatives, and Big Data policies. 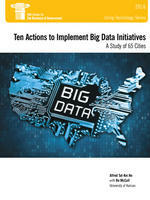 Based on his research findings, Professor Ho sets forth 10 recommendations for those responsible for implementing cities’ Big Data initiatives—five recommendations are directed to city leaders and five to city executives. A key recommendation is that city leaders should think about a “smart city system,” not just data. Another key recommendation is that city executives should develop a multi-year strategic data plan to enhance the effectiveness of Big Data initiatives. The report builds on the IBM Center’s long interest in Big Data. The IBM Center’s report Realizing the Promise of Big Data: Implementing Big Data Projects, by Kevin C Desouza, provided an overview of Big Data in government. Another report, Using Mobile Apps in Government, by Sukumar Ganapati, examined mobile data, which is also discussed in the Ho report. A Guide to Making Innovation Offices Work by Rachel Burstein and Alissa Black discusses how local governments organize their innovation initiatives.